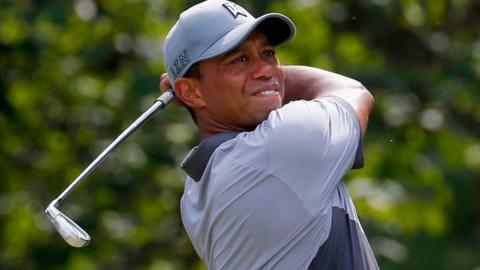 Tiger Woods is two strokes off the lead after round three of the Wyndham Championship in North Carolina. The 39-year-old was joint leader at the halfway stage in his quest for a first title since the 2013 WGC Bridgestone. USA's Jason Gore shot an eight-under 62 for a two-shot lead on 15 under par, with England's Paul Casey on 12 under. Woods, who has fallen to 286 in the rankings, carded three birdies in a 68, dropping his only shot when he three-putted the final green. The 14-time major champion is tied on 13 under with Sweden's Jonas Blixt (62) and American Scott Brown (66). Woods is currently 187th in the FedEx standings and only the top 125 qualify for next week's Barclays tournament. The former world number one could move up sufficiently with a second-place finish and he began his third round in style with a birdie from inside 10 feet at the opening hole. Playing partner Tom Hoge put his approach even closer but missed his birdie opportunity and mixed five bogeys and three birdies in a 72 that saw him drop to a share of 21st place, six adrift. Woods made 15 pars, with a remarkable save at the 10th when he missed the green to the right, had to take a drop in deep rough to get relief from the grandstand, chipped out 24 feet past the flag and holed the putt. But his run of 28 holes without a bogey came to an end at the 18th when his return effort from six feet lipped out and he will be in the penultimate group in the final round. World number 252 Gore, the 41-year-old from Van Nuys, California, has only one PGA Tour win, at the 84 Lumber Classic 10 years ago.